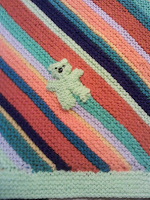 I wanted to make a baby blanket that was bright and colourful just as my Daughter-in-Law Chizzy asked for. She wanted a bright colourful blanket or anything else for the baby so I came up with this. This is Left side of the blanket. This is the Right side of the blanket. 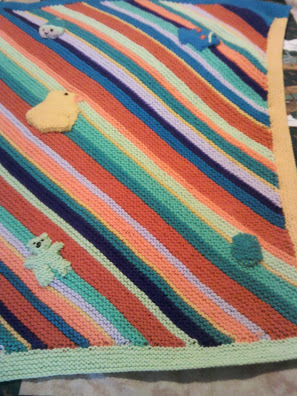 You can see the blanket is colourful and very bright. The colours are much brighter in reality than they are here. 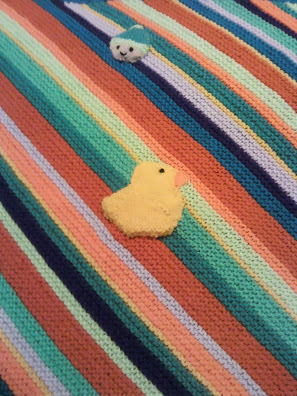 This is close up of the Duck and the Baby face on the blanket. 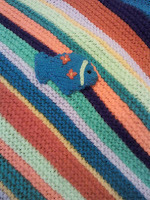 This is a fish that I knitted and worked some embroidery on it as well to make it look a little more interesting. Teddy was fun to make as he was smaller than the pattern stated. To make him smaller I used a smalled sized needle. He looks quite cute on the blanket and being green a little different. A tree with bright red apples on it seemed to balance the whole thing out. I started off by selecting the colours I wanted to use in DK yarn and used a 5mm circular needle and knitted back and forth. Starting with one stitch I increased until I had a really full cable needle then started to decrease. I used the same pattern that I use for my 8 inch Square. I changed the colours as I felt like it using the bright yellow as a single row of Garter stitch to break up the other colours. When the square was complete I made the motifs and carefully sewed them in place. I went round the edges of the motifs to stop little fingers getting stuck or picking at the motif. 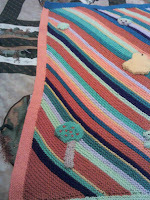 Then came the borders, I picked up stitches down one edge and knitted 10 rows then bound off. I did the same on the other sides so there are no mitres and did each side a different colour. 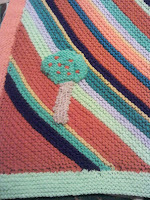 By using different colours I was able to keep the colour scheme of the blanket going rather than have all one colour. I think I have come up with something different that no one else will have. Fingers crossed Chizzy likes it.